Washington, Dec 15 (Just News): The US ambassador to the UN has called for an international coalition to counter Iran's influence in the Middle East, while accusing the country of "fanning the flames of conflict" in the region. Nikki Haley, standing in front of what she said were the remnants of Iranian-made weapons, said the US has found evidence that Iranian ballistic missiles were transferred to, and used by, the Houthi rebel group in Yemen, a violation of Tehran's international obligations. 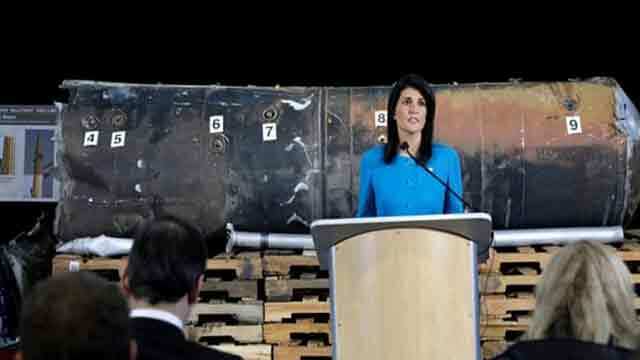 "In this warehouse is concrete evidence of illegal Iranian weapons proliferation gathered from direct military attacks on our partners in the region," Haley said during a news conference in a military hangar near Washington DC on Thursday. The US is going to "build a coalition to really push back against Iran and what they're doing", Haley said, without going into specifics. She said the recovered pieces of the weapon came from a missile "fired by Houthi militants from Yemen into Saudi Arabia", a staunch US ally in the region. Haley said markings on the missile proved it was made in Iran. "These are Iranian made, these are Iranian sent, and these were Iranian given," she said. Al Jazeera could not independently verify the ambassador's claims. Reuters news agency said Iran denied supplying the Houthi rebels with such weapons and described the arms Haley displayed on Thursday as "fabricated". On Twitter, Javad Zarif, Iran's foreign minister, responded by posting side-by-side photos of Nikki Haley and Colin Powell, US ambassador to the UN during the George Bush administration. Powell told the UN that Iraq had "weapons of mass destruction", a claim that built the case for the US invasion of Iraq in 2003 and was later disproven. "When I was based at the UN, I saw this show and what it begat," Zarif said in his tweet. Haley's comments come amid a war of words between Iran and its regional rival, Saudi Arabia, over several issues in the region. Last month, the Saudi government accused Iran of committing an "act of war" after it said the Houthi rebels had fired a missile towards the international airport near Riyadh. On December 1, Saudi Arabia said it had "intercepted" a second missile launched by the same Yemeni group. A Saudi-led coalition is waging a military campaign against the Houthi rebels, causing a dire humanitarian crisisin Yemen. Saudi Arabia welcomed Haley's comments on Thursday, saying it condemned "the Iranian regime for its flagrant violations of the international resolutions and norms", according to the Saudi Press Agency. The UAE, which is part of the Saudi-led coalition, said the evidence provided by the US "leaves no doubt about Iran's flagrant disregard for its #UN obligations, and its role in the proliferation and trafficking of weapons in the region". "The #UAE calls on the global community to more forcefully address the threat posed by #Iran," the UAE ministry of foreign affairs said on Twitter.